FIJI JF – FAME in Jet Instrument, SA5000-2 | Lazar Scientific, Inc.
IP 583; ASTM D7797 “Determination of the fatty acid methyl esters (FAME) content of aviation turbine fuel (AVTUR) with Fourier Transform Infrared spectroscopy – Rapid screening method”. The Patented Fame In Jet Instrument (FIJI) offers you a rapid and easy check on parts per million (ppm or mg/kg) levels of FAME in aviation fuel using test method IP 583. FIJI uniquely utilises state of the art Fourier Transform Infrared Spectroscopy (FTIR) technology and a patented sample preparation system which allows FAME detection accuracy down to the 10mg/kg level. You can use the FIJI as a field or lab based screening tool to give a quick indication of possible FAME contamination that may then necessitate further investigations. 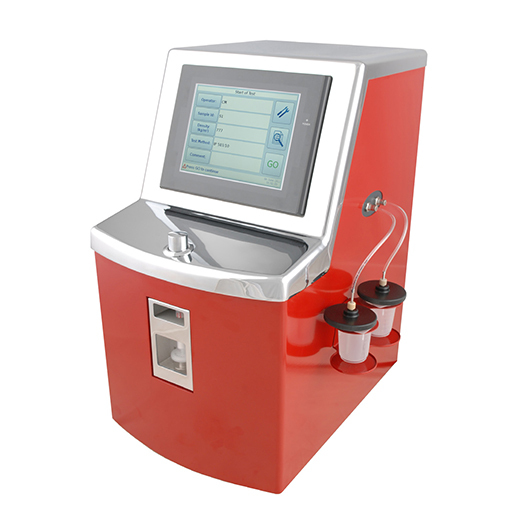 You can use the instrument to prevent expensive testing and avoid costly delays of fuel release. If you are an existing users of FIJI Jet, you can upgrade to enable measurement of FAME in Distillate & Residual Fuels in accordance with ASTM D7963 using SA5050-0. ASTM D1655, Defence Standard 91-91 and EI/JIG standard 1530 , the specifications for Aviation Turbine Fuels, AVTUR, Jet A, and Jet A-1, have been updated to allow the new 50mg/kg FAME limit and now include IP 583 and ASTM D7797. Table 3 Incidental Materials has been updated and the level of FAME permitted in JET fuel has been increased from 5 mg/kg to 50mg/kg. An emergency release of 100 mg/kg is permitted when authorized by the airframe and engine manufacturers. Table 3 includes the FIJI Rapid Screening methods, IP 593 / ASTM D7797, as accepted test methods for the new 50mg/kg FAME level. The levels may increase to 100 mg/kg after two years, once the industry has been able to evaluate the field performance of fuels with higher FAME levels. Table 1 Incidental Materials will include a maximum of 50 mg/kg with an emergency release of 100 mg/kg. Table 2 includes the FIJI Rapid Screening methods, IP 593 / ASTM D7797, as accepted test methods for the new 50mg/kg level. From 2nd May 2015 FAME measurement will become a mandatory part of recertification which is conducted at the upstream supply terminals and prior to movement to airport. FAME tests are now mandated in DefStan 91-91. Bulletin No.76 – Aviation Fuel Quality Requirements for Jointly Operated Systems (AFQRJOS) – has been issued with new guidance on specification changes and a revised Joint Fuelling System Checklist.